Design overhaul for premier building and civil construction. Clark Construction Group is one of the premier building and civil construction firms in the United States. 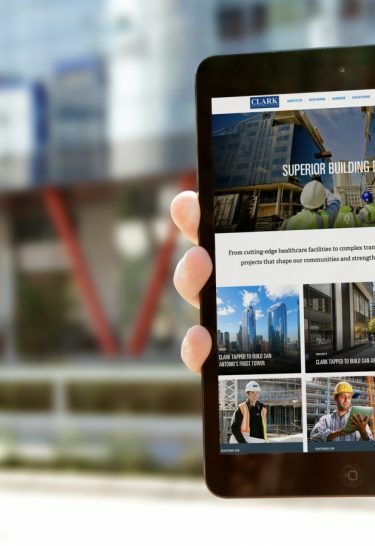 We gave Clark Construction a revitalized design on flexible Drupal modules to reinforce branding with aggregated and curated content from multiple channels. Reinvigorate design with social and other media integrations on a flexible system for improved content curation capabilities. Implemented a flexible grid system to create easily manipulated content blocks for improved publishing capabilities and integrated key social media feeds. Clark Construction is able to present dynamic and engaging content and in effect has increased conversions and strengthened the brand image. We used a powerful Drupal platform to integrate the refreshed design with aggregated and curated content from multiple sources. 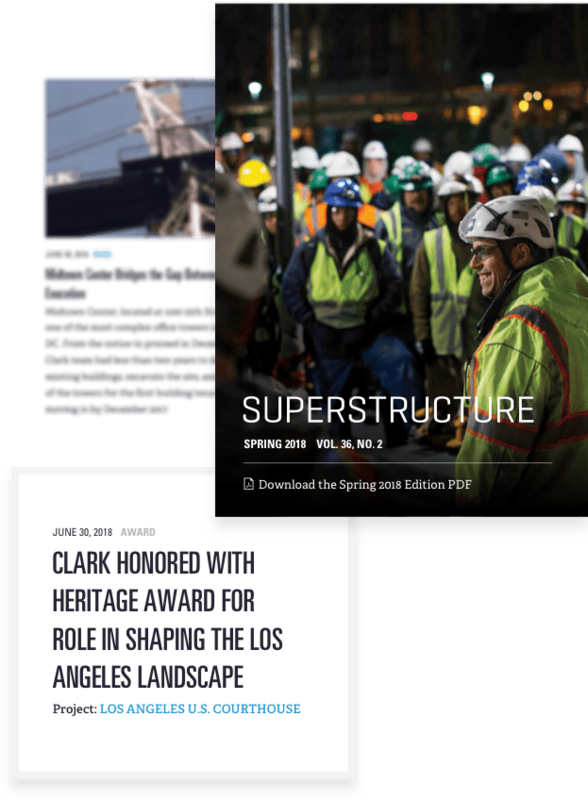 These sources include Clark Construction news, projects, the Superstructure newsletter, and social media platforms. To account for this wide variety of content types, WDG’s design team created a grid structure that allowed administrators full control of content curation. Using content blocks, Clark Construction administrators can easily feature updated and relevant content from any of these sources simultaneously on the homepage. This flexibility creates an avenue for a continual content refresh and unique user experience. 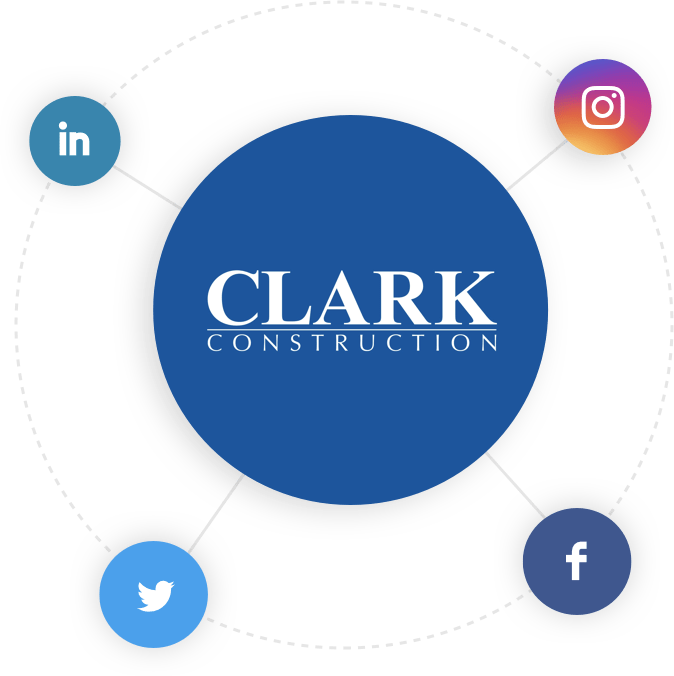 Clark Construction needed to improve their social media integrations, particularly for their home and Careers pages. By providing a tailored, more automated approach for important updates, content could be produced on a more frequent basis in key areas of the site. This has attracted talent, generated leads, and increased traffic. We connected their LinkedIn feed, in particular, to promote highly skilled positions on higher traffic pages. Administrators must be able to quickly and easily swap content on various pages, due to the numerous types and levels of projects. We created a flexible grid structure that could be repurposed across pages. 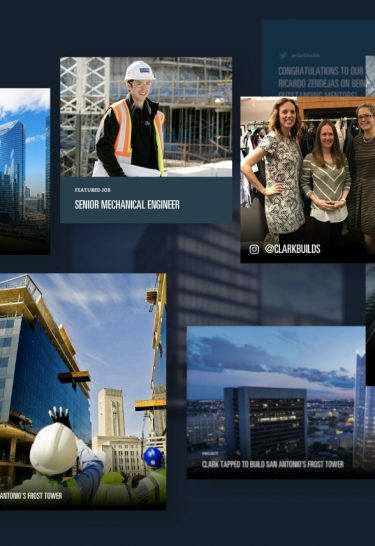 Clark Construction was given the tools needed to continuously present dynamic and engaging content. The structure ensures an easier administration experience for the Clark Construction team, accounting for a wide variety of content needs at any given time. Our team designed a new footer with an increased overall width of specific elements to accommodate the grids within this tapestry approach. To better reinforce the Clark Construction value of safety and integrity, we instituted a design refresh which emphasized the key Clark Construction initiatives more prominently. We utilized style guides across the layouts to ensure consistency. 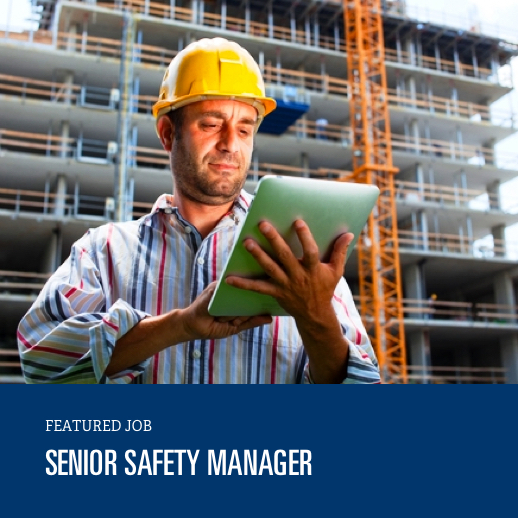 The homepage integrates auto-looping video content to highlight the culture of safety as a tenet of the brand. WDG incorporated key strategies to highlight the success of the brand for internal and external marketing initiatives. Strategies include integrating LinkedIn opportunities across pages, incorporating testimonials in key locations, and utilizing the style guide consistently.